Consanguinity has important implications for public health as it increases the risk of passing on autosomal recessive genetic disorders to the next generation. Thus, it is important that we learn more about the factors that may contribute to a decline in consanguineous marriage. 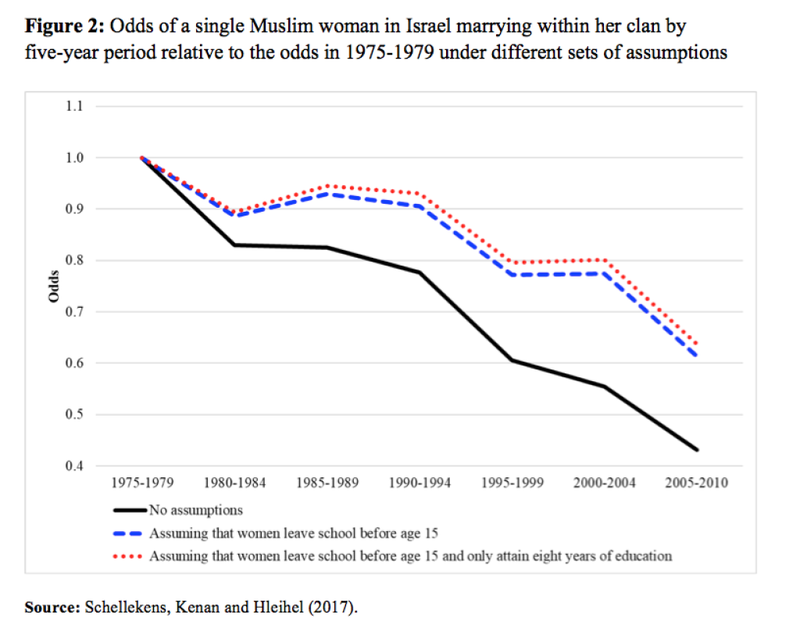 Jona Schellekens, Guy Kenan, and Ahmad Hleihel explore the contribution of women’s education to the decline in consanguinity among Muslims in Israel. The results of their research indicate that the rise in the age at leaving school explains about a third of the decline, while the role of the rise in level of education is negligible. Consanguinity increases the risk of passing on autosomal recessive genetic disorders to the next generation. Thus, it is important to learn more about the factors that may contribute to a decline in this practice. In a recent paper (Schellekens, Kenan and Hleihel 2017) we explored the contribution of women’s education to the decline in consanguinity among Muslims in Israel. The last few decades have witnessed a revolution in women’s education with widespread implications, for instance, on the decline in marriage and in marital fertility. While several studies have estimated the separate effects of enrolment in school and the level of education on marriage in general, there are no comparable studies on consanguineous marriage. Better educated women may demand more freedom in choosing a marriage partner. Education may empower women, but there may also be an incompatibility of roles, which prevents them from fulfilling spousal obligations while going to school. An increase in the age at which women leave school is in itself likely to affect consanguineous marriage, because the older the woman, the more empowered she is – and perhaps the less attractive she is on the marriage market, at least where this is still traditional. It is not a coincidence that there are no studies on the separate effects of enrolment in school and level of education in the decline in consanguineous marriage. To estimate the separate effects, surveys need to include single women. One of the very few surveys that has this piece of information is the Palestinians in Israel Socio-Economic Survey. The first three rounds of the survey were completed in 2004, 2007 and 2010 (El-Sheikh Muhammad 2005; Bashir, Sheikh Muhammad, and Rohana 2008; Sheikh Muhammad and Khatib 2011). In the survey, a consanguineous marriage is defined as a marriage within the same clan or extended family (hamula in Arabic). Muslims constitute the second-largest religious group in Israel. The vast majority of them speak Palestinian dialects of Arabic. In 1975, they constituted less than 12 percent of the population, but by 2010 their share had risen to 17 percent. In the 1960s, their fertility reached a peak of more than nine births per woman, mostly as the result of a decline in breastfeeding. However, by the mid 1970s their fertility started to decline, reaching a total fertility rate of 3.3 births per woman in 2016, only slightly higher than the number of 3.1 births per Jewish woman. At about the same time, there was an increase in women’s education: while less than five percent of women born in 1945-49 completed twelve years of schooling, more than fifty percent of those born in 1975-79 did. In 1975-79, 52 percent of the women who married did so within the clan, whereas by 2005-10 the percentage had declined to 39.4. In 1975-79, the average age at first marriage with a relative was 18.7, whereas by 2005-10 it was 20.9. Figure 1 presents estimates of five-year averages of the annual probability of a consanguineous marriage among 20-year old women. For technical reasons, we used a related concept, odds, instead of probabilities, in the analysis. Figure 1 shows that the probability (odds) declined from almost 0.12 (0.13) in 1975-79 to almost 0.05 (0.06) in 2005-10 (solid line). For comparison, the probability of a non-consanguineous marriage declined from 0.09 to 0.03 (dashed line). We estimated the effect of enrolment in school and educational attainment on marriage in a logistic regression model, in which we tried to explain trends in the probability of a woman marrying a relative at a specific age as a function of a variable indicating whether she was still in school or not and another variable measuring her educational attainment at that age. Therefore, all our results will be presented in terms of (relative) odds instead of probabilities. 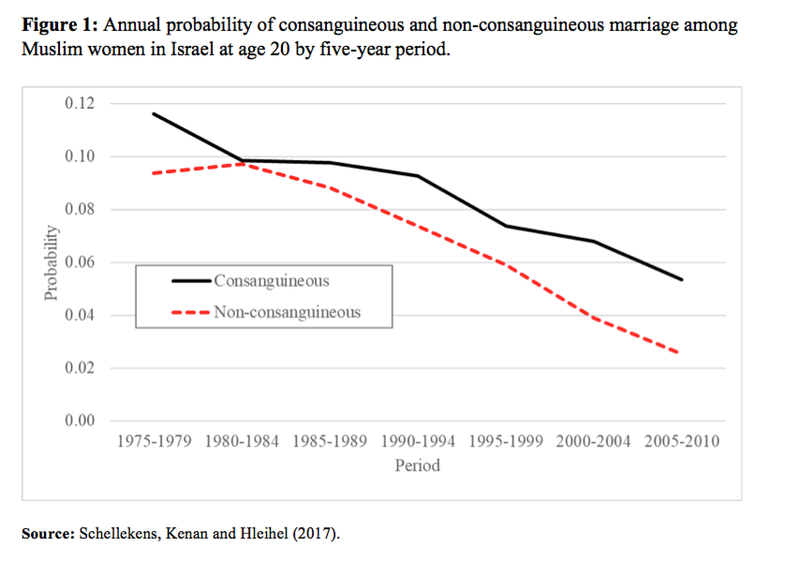 We used a very simple graphic method to illustrate the separate effects of enrolment in school and level of education on the decline in consanguineous marriage among Muslims in Israel (Schellekens et al. 2017). The solid line in Figure 2 shows the odds of a single woman marrying within her clan by five-year period relative to the odds in the initial period of 1975-1979. It shows that they declined by almost 60 percent. To measure the contribution of enrolment in school to the decline, we would have liked to turn back the clock and ask all women to leave school before age 15 while reaching the same level of education, to see what would have happened to consanguineous marriage over time. This being impossible, the next best thing that we can do is to simulate in a logistic regression model what the decline would have been if all women had left school before reaching age 15 without any drop in their level of education (dashed line in Figure 2). The distance between the solid (black) and the dashed (blue) line provides an estimate of the contribution of enrolment in school to the decline in consanguineous marriage. The odds of marrying consanguineously declined by about 60%. Almost 20 percentage points of this (or a third) is due to the fact that women stayed in school longer. To estimate the contribution of the level of education to the decline, we computed what would have been the decline in the odds of marrying a relative if, in addition to the assumption that all women had left school before reaching age 15, no women had attained more than eight years of education. The dotted (red) line in Figure 2 shows the result. The distance between the dashed and dotted lines is very small, indicating that a higher level of education per se contributed only marginally to the decline in consanguineous marriage. Educational attainment explains less than five out of the 60 percentage points. Much of the decline remains unexplained. Perhaps attitudinal change unrelated to educational attainment explains part of the rest. Support for this hypothesis comes from a preliminary analysis of the decline in marriage among Muslim women based on census microdata, which shows that the decline after 2000 is the result of a new generation or, more accurately, a new cohort entering the marriage market. Younger generations often challenge the values of older ones. For comparison, we did a similar exercise for the odds of marrying outside the clan. Figure 3 shows the results. The solid line in Figure 3 shows the odds of a single woman marrying outside her clan by five-year period relative to the odds in 1975-1979, which declined by more than a third. As in Figure 2, the distance between the solid and the dashed line indicates that if women had left school before age 15 (all else equal, i.e., with the same level of education), then non-consanguineous marriage would have declined much less. The dotted line shows what would have happened if, in addition to the assumption that all women had left school before reaching age 15, no women attained more than eight years of education. In the case of non-consanguineous marriage, the dotted line is close to the solid line instead of being close to the dashed line, as it is in the case of consanguineous marriage. This indicates that the level of education more or less cancels the effect of enrolment in school. In other words, education did not contribute much to the decline in non-consanguineous marriage. Moreover, our results appear to indicate that more educated women are actually more likely to marry! A positive correlation between educational attainment and marriage has also been reported in Western societies and among Jewish women in Israel (Schellekens and Gliksberg 2018). Oppenheimer and Lew (1995) suggested that better education provides greater access to more attractive marriage markets. Our results indicate that the age at leaving school may contribute to declines in consanguineous marriage. We did not find evidence for a contribution of a higher level of education to the decline, suggesting that the content of education is less important. Thus, states may be able to contribute to a decline in consanguineous marriage by extending compulsory education to secondary school or by raising the legal age at marriage. Bashir, N., A. Sheikh Muhammad, A. Rohana (2008). The Palestinians in Israel Socio-Economic Survey 2007: Main Findings. Shefa-Amr: The Galilee Society, Rikaz Databank and Al-Ahali. El-Sheikh Muhammad A. (2005). Palestinians in Israel Socio-economic Survey: Main Findings 2004. Shefa-Amr: The Galilee Society and Rikaz Databank. Oppenheimer V.K., V. Lew (1995). “American marriage formation in the 1980s: How important was women’s economic independence?” In K. O. Mason and A.-M. Jensen (eds. ), Gender and Family Change in Industrialized Countries (pp. 105-138). Oxford: Clarendon Press. Schellekens J., D. Gliksberg (2018). “The decline in marriage in Israel, 1960-2007: Period or cohort effect?” European Journal of Population 34: 119-142. Schellekens J., G. Kenan, A. Hleihel (2017). 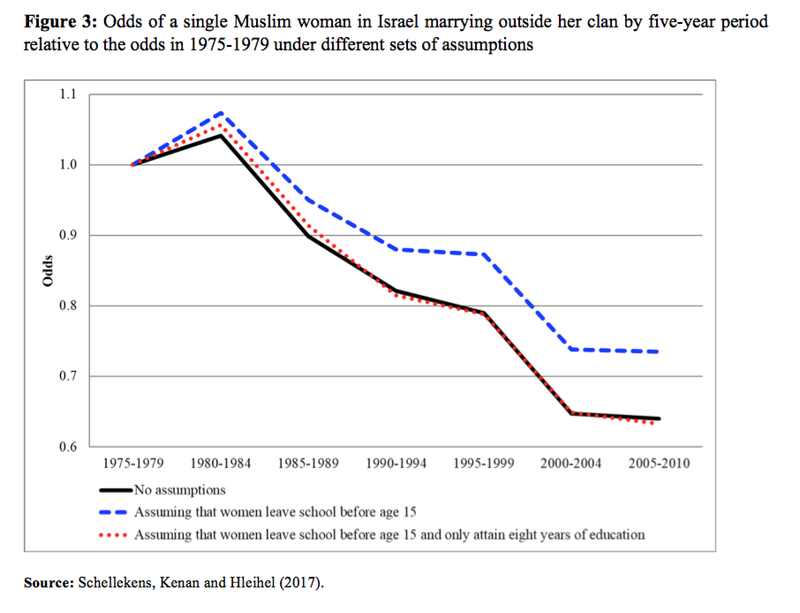 “The decline in consanguineous marriage among Muslims in Israel: The role of education”. Demographic Research 37: 1933-1948. Sheikh Muhammad A. and M. Khatib (2011). The Palestinians in Israel Third Socio-Economic Survey 2010: Main Findings. Shefa-Amr: The Galilee Society and Rikaz Databank.